To make college and career readiness a priority in the states, in 2005, Achieve launched the American Diploma Project (ADP) Network. 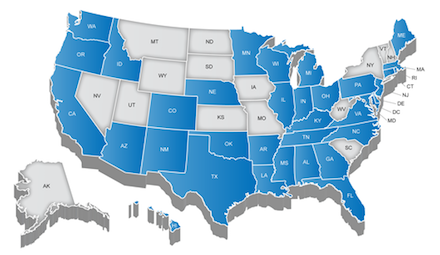 Starting with only a handful of states, the Network grew to include 35 states (shown in blue on the map) educating 85 percent of all U.S. public school students. Through the ADP Network governors, state education officials, postsecondary leaders and business executives work together to improve postsecondary preparation by aligning high school standards, graduation requirements and assessment and accountability systems with the demands of college and careers. Align high school standards and assessments with the knowledge and skills required for the demands of college and careers. Establish graduation requirements that require all high school graduates to complete a college- and career-ready curriculum so that earning a diploma assures a student is prepared for postsecondary education. Develop statewide high school assessment systems anchored to college- and career- ready expectations. Create comprehensive accountability and reporting systems that promote college and career readiness for all students. Although all Network states are committed to a common set of key policy priorities, there's no one-size-fits-all approach. Each state has developed its own action plan for carrying out the agenda.